What Would Really End “Too Big To Fail”? As we move closer to a Senate – and presumably national – debate on financial reform, the central technical and political question is: What would prevent any bank or similar institution from being regarded – ultimately by the government – as so big that it would not be allowed to fail. If you are “too big to fail” (TBTF), credit markets see you as lower risk and as more attractive investment – enabling you to obtain more funding on cheaper terms, and thus become even larger. Everyone agrees, in principle, this is a bad arrangement. It’s an unfair distortion of markets – giving huge banks the opportunity to grow bigger, because they have implicit government guarantees. It is also manifestly unsafe, because it encourages reckless risk-taking: If things go well, the TBTF bank gets the upside; if there is mismanagement of risk, or just bad luck, the downside falls to the taxpayer and to society more broadly. These costs can be huge: 8 million jobs lost since December 2007. But there remains sharp disagreement on what exactly would end too big to fail. The main views fall primarily into three camps. The view of Senator Dodd, Democratic congressional leadership more broadly, and the White House – and actually the big banks themselves (e.g., Jamie Dimon in Wednesday’s Wall Street Journal) – is that the creation of a “resolution authority” would, at a stroke, effectively remove the perception and the reality that some banks are too big to fail. The basic idea here – as elaborated on by Sheila Bair this week – is that the Federal Deposit Insurance Corporation (or potentially another agency) would expand the powers it currently has to “resolve” – i.e., takeover and liquidate in an orderly manner – banks with federally insured deposits; in the future, it could do this for any financial institution. The view of leading Republicans is that the Dodd-Dimon approach would just formalize the existence of TBTF banks. Peter Wallison and David Skeel, for example, argue strongly that the FDIC has no competence in winding down large complex financial institutions – and they are certainly correct that this task would be quite different from closing small or medium-sized banks while protecting depositors. But their proposal – which seems to also have the support of Senator Richard Shelby (ranking Republican on the Senate Finance Committee) is that we should just allow big financial firms to fail outright, i.e., to run through the usual bankruptcy procedures. At a rhetorical level, “let ‘em fail” has some appeal. But as a practical matter, it is a complete nonstarter. Remember that when Treasury Secretary Hank Paulson decided to let Lehman fail in September 2008, credit markets immediately choked and the global economy teetered on the brink of a Second Great Depression. When another mega-bank starts to meltdown, any future president – no matter how libertarian or interventionist by inclination – will face the same horrible moment of decision: Let the financial system collapse or provide an expensive rescue. It is striking in this context that Mr. Wallison and others from the right used to be outspoken proponents of downsizing financial institutions that had become so large that they were assessed (correctly, as it turns out) Too Big To Fail – but that was when the debate was about Fannie Mae and Freddie Mac. The third approach, articulated most clearly so far within the Senate by Ted Kaufman (D., DE) is much simpler and more direct: Break up these mega-banks. 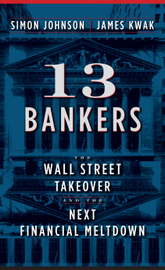 As even Alan Greenspan said in October 2009, “If they’re too big to fail, they’re too big” (see Chapter 9 of 13 Bankers). There is no evidence for economies of scale or scope – or other social benefits – from banks with assets above $100 bn. Yet our largest banks have balance sheets around $2 trillion and Mr. Dimon defiantly affirmed last week – in his letter to shareholders – that JP Morgan Chase should be allowed to grow bigger, if it so pleases. But any such growth would not be outcome of any fair or normal market process. Rather it would reflect the Too Big To Fail implicit subsidy on which Mr. Dimon can now draw, manifest in the form of lower funding costs. Mr. Dimon may or may not be a good manager of risk, but he will not run JP Morgan Chase for all time. Sooner or later, one or more our biggest banks will run into serious trouble. And at that moment, it will matter a great deal whether “biggest bank” means assets of 2-4 percent of GDP (as we propose) or 20 percent of GDP (roughly our current situation) or over 100 percent of GDP (the problem of RBS, the largest UK bank, which essentially failed in 2008). Making our largest banks smaller is not sufficient to ensure financial stability. As we review in 13 Bankers, there are many other complementary measures that make sense – including higher capital requirements, more transparency for derivatives, and generally more effective regulation. But reducing the size of our largest banks is absolutely necessary if we are to reduce the odds of another major financial catastrophe. Make our largest banks small enough to fail. There is simply no other way to really end the problem of Too Big To Fail. This piece previously appeared, in an edited version, on the NYT’s Economix this morning – and it is used here with permission. If you would like to reproduce the entire post, please contact the New York Times. Jamie wants to get bigger eh? Why not let him have East of the Mississippi, Wells Fargo West. Goldman can officially become United Sac(hs) States, then we can move on. Right? Easy-peasy. This is an argument about timing, not substance. The obvious solution to too big to fail is to break banks up, but the obvious time is not now. The first priority is to restore economic growth at minimal cost to the Treasury. That requires private funds to recapitalize banks, and private banks that appear both safe and lucrative to private investors. Hence, Treasury’s light touch thus far on too big to fail issues. The question is whether Treasury will be able to push harder on too big to fail issues once the economy is back on its feet. Simon fears that the Administration may not be able to act once the crisis is past. He may be right, but I would far prefer to take that risk than the risk that precipitous government action now on too big to fail would cripple the restoration of more normal credit conditions. It seems that part of the risk we face (and the thing that defies regulation) is the massive complexity (‘awesome’ was Greenspan’s word) of current banking. It strikes this non-economist as obvious that complexity of this nature is anti-market. After all, how is commerce conducted when (at least) one side of a transaction does not understand it; I would say that commerce of this sort favors the shady and well-connected in addition to being a steep and cryptic tax on a lack financial sophistication. To get the point: why not simplify banking? If all of the fancy “innovations” have not helped society, what is the loss of removing those complex instruments from banking? Although market fetishists would squeal about ‘socialism’, in reality, the dangers of such a system result in massive (and now quite obvious) externalities. Thus, it is not paternalism that motivates the attempt to rein in complexity. Perhaps that answer is in your book, but your book is sitting unopened at the bedside for the moment . . .. Is it just politics? There is no serious debate here. We already know for a fact that so long as these rackets exist, they’ll defeat any “regulation”. All enacted policy will be either a sham, or even if by some miracle a legislature temporarily became interested in the public interest again and passed a bill which could in theory be real reform, the rackets would soon erode and then quash serious enforcement. It’s an endless war of attrition the rackets will always win so long as they exist at all. “Resolution authority” is one of the bait-and-switch scams, like the “public option” or the CFPA, meant to sound good in theory and misdirect well-meaning people away from a firm demand for real change, but which in practice is meant to never be enacted at all, or to be enacted in purely potemkin form. We know for a fact that any resolution authority, no matter what it says on paper, will be disregarded in the heat of the crisis. That’s the disaster capitalist battle plan, and in the crisis the combo of aggressive fearmongering (a form of terrorism, as in the case of Paulson and Bernanke threatening that “by Monday we won’t have an economy”) and inchoate mass panic will always guarantee the bailout goes through. This is already what happened with the PCA law, the resolution authority which already exists in theory and was never meant to be used in practice. And it wasn’t. This is guaranteed so long as the rackets exist. Aggressively breaking up the banks, while not sufficient, is definitely necessary. Those who pretend there’s any debate on this either don’t really want reform, or are among the cowards who aren’t willing to fight for it, so they hearken to lies from the likes of Krugman and pray he’s right. Just like they did with the health rackets. I do not believe that there is a set of regulations that would on their own sufficiently reduce the risk of another systemic bubble. That said, however, three simple steps could go a long way toward restoring order and transparency in the banking system. 1) Restore the Glass-Steagall segregation of investment activities from banking institutions. This would result in dividing the largest institutions and eliminating some of the behavior, the toxicity of which was amplified by their size. 2) Require that more classes of transactions be done on public exchanges with full exposure to securities law. 3) Create a consumer protection agency that can at minimum evaluate and rate investment instruments and methods. Greenspan is right that regulators will always be playing catch-up to “the smartest guys in the room”. Similarly, there is nothing that can prevent people from making bad investment decisions. Nevertheless, by putting in place basic, bright-line regulations and making it possible for more due diligence to be performed in an informed manner, we restore some balance to the system. ), and you would see clearly that nothing would have been done differently in the housing bubble, simply because the groupthink that housing prices couldn’t crash was so pervasive. TBTF means we ought to be looking at a host of companies through the lens of anti-trust laws. And anti-trust laws should be reviewed, and amended if necessary, to include companies that are so big they provide an threat not only to competition, but to the greater economy. AT&T, Exxon, GE, WalMart — would these companies’ failure could bring down the economy? Let me engage you rhetorically. What is the most important financial market function, to the US government ? It has to be the ability to finance itself, i.e.,the Treasury market. And does that market need its Primary Dealer network to function ? So it would appear. And are these Primary Dealers not all global mega-banks ? Indeed. Does that not suggest that a bank needs to be of a certain size to be able to function as a Primary Dealer ? Hmm, that conclusion is certainly suggested. Breaking up TBTF Primary Dealers will not happen, IMHO, based on the reasoning outlined briefly above. u miss the point that we have reached the point where we cannot have sustainable growth while big banks still exist. they are extracting wealth out of the private sector as we speak and NOT providing credit simultaneously. its plain to see in the data. I’m really weary of hearing from those of you who are stuck in this kind of MBA-in-finance-bankster-paradigm-that-is-all-that-exists-in-the-universe. You all should be shipped to Guantanamo. You’re not going to see any reform, or a break-up of the TBTF. Just more of the same, until America falls. The problem with creating a Resolution Authority (or, as the Republicans want, a new chapter in the bankruptcy code) is this – it can’t react fast enough to a market crisis. Monday – Everything is fine, nothing to see here folks. Thursday – We have some minor issues, no big deal. Friday after the bell – Holy crap! It’s a disaster. If the Fed/Treasury can’t get this situation fixed before the Asian markets open Monday morning it will be global financial armageddon. Bankruptcy courts and Resolution Authorities cannot move anywhere near that fast. I’m not supporting the ad hoc, make it up as you go along approach the Fed/Treasury took, just pointing out the temporal aspect of the problem. Neither LTCM nor AIG were banks or anything remotely approaching banks. Yet both threatened the global financial system and required massive sovereign intervention. This must be addressed. While I don’t necessarily disagree with you that big is rarely good, GM and Chrysler needed government rescue because of the financial crisis. What I mean is that GM & Chrysler, under normal economic conditions, could have sailed through a chapter 11 restructuring without much of a problem. However, because of the credit crisis there was an extremely high probability that neither firm would have been able to secure DIP financing (Debtor in Possession). Without DIP financing they would have been forced into a chapter 7 liquidation which would have tipped off the supply chain crisis that the government feared. Would a better way to frame the TBTF problem be to frame it as a type of antitrust problem and then apply the antitrust laws? Basically, what you’re saying is that banks of a certain size no longer compete, i.e., bank size enables anti-competitive behavior. I’ve recently been using Google Books to research the history of trust busting in the U.S., and anti-TBTF rhetoric that actually worked seems to be readily at hand. I’ve had this “let ’em fail” argument with people and I have a hard time explaining exactly how a Second Great Depression would have played out. Having “smarter regulators” implies vesting them with even more discretion. Unfortunately, when the regulators are captured by the industry they’re supposed to regulate, discretion results in inaction. It’s not that they can’t see the true nature of the problem, it’s that they’re rewarded for ignoring it. It’s not too late to turn the tide. Somebody just has to figure out a middle ground between Paul’s technocratic incrementalist approach (which is nowhere near as bad as you assert) and your “we must have Armageddon first” approach. The trick is finding a new but familiar meme that mobilizes everyone. As a meme, TBTF fails. Why cant you just increase the cost of capital of banks as they grow bigger, thus negating the TBTF cost of funds benefit? In this way, dont have the complicated breaking them up, nor the do nothing approach or worse, the govt meddling. I prefer the dismemberment of TBTF, beginning with a brightline demarcation between commercial banking and investment banking. But if no such thing is done, then what will be done when TBTF does crater again? You need a substitute that can step in and carry on the functions. How about a national bank? If we’d had such an institution, a great number of ineffective Treasury/Fed schemes would not have been necessary. Lending to Main Street a problem? Not so much with a national bank network. Putting together a bailout package? A national bank could have helped directly and with a minimum of fuss. We need a backup in place, and a national bank would be a good one. As I have said before, we have models in the natural world that suggest how to have a successful financial system. For one thing, we have models of catastrophe, such as avalanches and forest fires. Catastrophe can be averted by inducing small, controlled avalanches and fires. This corresponds to “taking away the punch bowl”, in the words of William McChesley Martin. That was something that the Greenspan Fed avoided doing. For another, we have the model of the brain, a highly connected, complex system in which each element of the system (neuron) is sparsely connected. There is a natural tendency for networks to develop with a relatively few highly connected elements (hubs). The air traffic system is a good example. The brain could have developed that way, as well. But successful brains did not do that. Furthermore, the brain developed specialized neurons and groups of neurons. The Glass-Stiegel act enforced financial specialization; we should restore that. We also had limited connectedness for some banks in the U. S. Limiting the connectedness of international banking might be a good idea. To be sure, such strictures are inefficient in some ways. But the robustness of the system is very important. Before the Second Great Depression the immediate aftermath of a financial collapse must be dealt with. OK nothing was done in September 2008. Let them fail. Let the market decide and only the market until you cannot stand it continuing. We now know and many of us had some inside information on September 15, 2008 that a mass electronic run was underway that unchecked would have spiraled to a few trillion dollars within a very short time, say 72 hours. By the next day, September 16th probably all commercial paper conduits and funds in the shadow banking system would have suspended redemptions. Remember, that all the while this silent run was going on, that deposits were moving from one feared institution to another less feared institution by the panic striken owner of the deposits. One panic striken depositor would be depositing in the same institution another panic striken depositor was fleeing. But the panic striken were almost all fleeing the investment banks and shadow bank SIV’s. Hence, Jamie Dimon was right on the money that his people should anticipate the failure of all the big investment banks including Goldman Sachs. Ok, within 36-48 hours all the big investment banks, plus AIG and others similarly situated had filed short form bankryptcy filings and stopped all transfers of funds out or into their institutions. At that point, the banks themselves would have been forced to suspend electronic transfers . This would have required shutting down the banks and all markets. Everything shut down by September 20, 2008. Actually, the markets would have shut down of their own accord given no ability to settle transactions. From that point on the President would have been required to rule by decree to keep essential goods flowing and services rendered. Martial Law. Everyone would be ordered to continue going to work with the government arranging for funds transfers of a normal character to be processed by the banks. That would include, essential payment entities being able to overdraw at will by government decree since their cash intake systems would not be operational. If the situation deteriorated politically, the President would need to prorogue Congress. It is out of session period until it is a meek rubber stamp. At the end of all this gnasing of the teeth, the real economy must be kept going and the financial system put out of it’s misery. That means pension funds with no means to pay pensions. Medicare and hospitalization insurance has ceased to function. Similarly , with Social Security and so forth. At that point the state simply pays out the funds , in currency, if needs be with frozen prices and very high order interference in black marketeering. The situation would not be unlike that of Russia between the fall of the Tsar, the Kerensky interludeand the beginning year of the Bolsheviks. The Kerensky government and the Bolshies had to keep essential things at least semi working. The difference between then and now given the high tech electronic world is so vast that there are no historical comparitives. We are in uncharted waters. Having survived the financial collapse and having emerged from it is the point where we can discuss the Second Great Depression. At the worst, we will be forced to make do as if electronic systems were not working. NO one knows what happens with electronic collapse other than it is very likely. Electronic systems are very fragile and could not survive the nation tearing itself apart in civil strife. So, that means the dictator that is successful. For worse, the first world allowed Too Big to Fail to become the real world. Repealing deleterious real world’s is probabably not doable within time constraints imposed by collapsing systems that literally are the keys to survival. I don’t trust that “trick” can be pulled off. I’m open to be shown otherwise. Are we still not teetering? Isn’t that what this is all about? We’re still teetering. I still haven’t seen any plausible description or theory of where would be today if the stupid Fed & stupid Treasury hadn’t paid off the stupid investors (with OPM) who bought the stupid investments from the stupid, insolvent banks who are still insolvent & stupid & still not mediating loans to the real economy. We’re still limping along without Lehman. Does anyone doubt that we would still be limping along without Goldman. JPMorgan, BofA, et al? Does anyone believe we would be worse off without these stupid, insolvent banks & their stupid investors both of whom have pockets full of OPM? I think it’s about time we let the hair go with the hide. Let it all hang out. Flush the toilet. Have I told you the story about my old granpa’s method for getting the attention of the mule he used to plow his corn fields in Mississippi 75 years ago? He hit it in the head with a two by four. We still haven’t gotten their attention. You still need a regulator that is going to honestly say how much capital the institutions have, and not sign off on or turn a blind eye to shady accounting practices that optimistically value assets or label short-term cash liabilities like repo contracts as assets. So you are still stuck with the “honest, smart regulator” problem. Enjoyed Howard Davidowitz’s take on the financial crisis hearings and legislation. Agreed. Simple, clear rules that easy to follow and easy to detect violation of. Also, TBTF has to be done away with so no bank can hold the economy hostage. I agree. Get the Supreme Court to see the concentration of power as a “restraint of trade” and bust ’em up- as I argue on my blog. If this is about timing, I suggest the time has come to realize and accept that the taxpayers (citizens) of this country are all that stands behind the banking system. I humbly suggest we nationalize the Fed and make the boys (Jamie, Ken and all) bank with us. Then change the organization of the Fed and put 5 bankers on its board with lifetime positions. Let them elect a chairman. The system we’ve got is beyond fixing. Or perhaps you might say it’s already been fixed. I think looking at it as a, metamorphosis, might be constructive as well. JerryJ, thanks, I’m impressed. If you also factor in the role of JIT (Just-In-Time) in globlal supply-chain management, the situation becomes problematic, especially healthcare. While I’m sure that you are sincere in expressing that sentiment, I seriously doubt that you are “open.” If you were actually open, you’d make your own attempt at pulling off the “trick” instead of reserving your right to be a critic. Being a critic is easy, being a problem-solver is hard. The bad news is it has been proven that being a critic gets you farther ahead than actually proposing solutions to problems. If you honestly think there is any chance of more than one of the big banks being broken into ten or more pieces each, you have no connection to reality. The logistics alone would make that impossible. Dave Lewis – simply because your comment was immediately before this – you should exercise extreme caution in reading antitrust decisions from 1905 as though they are still good law. You need an agreement in “restraint of trade” to find illegality (Sec. 1 of the Sherman Act). Perhaps you could argue that certain past mergers “substantially lessen[ed] competition” (Sec. 7 of the Clayton Act), but the Fed and DOJ already passed on each of those deals, and it would politically difficult to reconsider (not to mention the serious factual problem that by typical antitrust standards, the industry simply isn’t very concentrated). Your other option is to argue that the big banks are illegally monopolizing (Sec. 2 of the Sherman Act), perhaps by virtue of the TBTF implicit subsidy, although that would be a novel theory. Anyway, my basic point, as I have said here before, is that by antitrust standards, the industry is not that concentrated, and no single institution appears to be a monopolist. Which is why, in my view, arguments about downsizing the big banks so that they aren’t TBTF should focus on the safety and soundness concerns that underlie bank regulation rather than antitrust. What Would Really End “Too Big To Fail”, the natural way, is the fourth way, namely the elimination of all those growth-hormones that made the too-big-to-fail too-big-to-fail. The other three ways, the unnatural way, would not end the too-big-to-fail, they would just contain the too-big-to-fail. The problem though is that the fourth way actually requires knowing more about the current regulations… and who has time for that? … I mean with so many talk shows and conferences. I’m no lawyer so you may be right (although the notion that the law is like math, with only one defined path ahead strikes my layman’s head as odd). I was following the lead of the Baseline boys (and thought the decisions made fascinating reading). As to breaking up the banks, on that issue I have some expertise. They will be broken up. The questions are when, and by whom. I’d better sign off before I lose this tenuous connection to reality. It isn’t that there is only one defined path. It’s that the courts and the agencies have been so “conservative” in terms of antitrust enforcement over the last 30 year, driven primarily by the influence of empirical methods, that simply observing, as Simon and James have, that the big banks are big and influential isn’t enough. If you are interested, Judge Bork’s (yes, that Bork) Antitrust Paradox is still a good read, and a decent historical document as to what changed in antitrust law roughly 30 years ago. As to your point about the inevitability of breaking up the banks, I will assume you are alluding to market forces that may result from future crises, in which case, I don’t think we disagree. This gets to the nub of the matter for me, and ties TBTF to Greenspan’s definition of Too Big: too interconnected to be unwound and liquidated in any orderly fashion. It’s also why I find TBTF to be somewhat of a non-issue. If you have stronger regulation, *individuals* tempted to circumvent it might get “bigger” in the sense of “richer”, but they’ll never be above the law; they’ll never be turned away from a prison on the grounds that no cell is large enough to accommodate them. The Big Three ratings agencies made a lot of money during the bubble, by offering passing (even stellar) grades to stuff that was junk when it wasn’t actually toxic. In some cases, they gave good grades to stuff that their own (over-optimistic models) said wasn’t very good, in response to customer complaints. Their defense now? First Amendment — they are just publishers. Well, I think some people at those rating agencies should go to jail. Although the GSEs have been seriously overblamed for the crisis, similar shenanigans were pulled at those operations too, with discarding modeling results that weren’t considered up to snuff. Much the same happened at a number of Wall Street firms. This is just fraud. Which is a crime. It’ll take years, but we’ll see a lot of individual failure, with aggressive enough enforcement of laws that were already on the books before this crisis. With more laws to address those getting off scot-free now, the message should become ever clearer. Regulations with real teeth make TBTF a non-issue. Sure, any given *institution* might be TBTF. But institutions are run by individuals with individual responsibility. Look, what is absolutely crystal clear to me is that Capitalism (here concieved as a economic system intended to benefit many, not just a few) cannot survive without competition in the marketplace, because competition is what creates value – the best goods and services at the best price. Thus, no business should be too big to fail, and to the extent an organization is TBTF it should be highly regulated or government run. The problem we have is a political and financial system that are intertwined and serving only themselves. We clearly need a separation of government and finance. We need strong and enforced anti-trust laws instead of “bravos” to M&As. We need an educated populace. We need loans to small business and R&D. It isn’t hard to come up with paradigms. It is hard to get people to see solutions. It is even harder to get the people in power to yield even one iota of it. You can’t have a country swing this far out of balance without something drastic bringing it back towards center. You want to treat the financial cancer symptoms – without excising the cancer. It won’t work. And truly, I think cancer is one of the best analogies for the current situation. Capitalism cannot exist without competition. Of course, anti-trust is a big piece of that. But most people don’t understand Capitalism, and instead have swallowed the “laissez-faire” free-market b.s., which has nothing to do with Capitalism, at least as envisioned by Adam Smith and others. Wall Street and D.C. cheer with every M&A. Haven’t you noticed that the Federal Reserve and Bernankio equate the stock market with the economy. The people in power could care less about anyone by themselves and their “friends.” Anyone who thinks there is genuine concern for Mainstreet by those who pull the strings is incredibly naive. It’s all a game of pillage. Now is the time. The JPM’s of Wall Street are doing almost nothing to actually assist the average citizen or the average small business to do better. They are only working the very largest deals and playing the markets (everywhere, everyday, and everything, be it China, Japan, US, currency, commodities, bonds, equities, etc.) Let’s face it, they didn’t get to be a two trillion dollar bank making $20,000 car loans, but by packaging those in the wholesale markets, by slicing and dicing them to get fees and sell them several times. It is a cruel GDP absorbing, non-cooperative role that they are playing in our economy. Jamie’s kingdom, as well as those of the other sovereign Wall Street leiges need to be broken up into many small pieces and care taken not to let anyone with an open window at the FED money mill be able to access nearly cost free money to play craps with. But, this is an old story. We need a Teddy Roosevelt to ride in and save us. Apart from what is discussed in the blog there is also a need for new revolutionary thinking about the nature, and purpose of capital..
See my evolving project on the p2pfoundation site concerned with TRANSFINACIAL ECONOMICS. Wasn’t the home-asset bubble caused by co-mingling of stable 15&30yr. mortgage paper with problematic “financial products” or fluid investments? Like mixing oil and water, a way to game the system by destabilizing it? An intentional act. And then buying insurance on the faulty product, thus destablizing it too? Then getting a bonus for being a “genius” and claiming ignorance. What a wonderfull world for the criminal class. I agree with your critique about bigness and influence- as Justice Holmes wrote in his dissent to the Northern Securities case, “size has nothing to do with the matter.” The harm must be defined in order to proscribe the behavior. As to the sentiment of the courts: Prior to the beginning of the 20th Century, the courts (with some notable exceptions at the state level, like Ohio) were at least equally biased towards big business. Sentiment changes slowly, but its manifestation appears suddenly, and a new trend begins. This is not to argue that Anti-trust will be the vehicle (and thanks for the Bork suggestion, I’ll check it out). Sometimes there is a need to pass new law to raise the excitement level. Perhaps even the Fed may grow some stones, but I think they lost their chance. It’s too bad Greenspan got seduced by his idealistic faith in “free markets” (the era he loved was policed far more rigorously by JPMorgan and his gang) and then the need to sell debt made enforcement of the big banks most conflicting. My comment about the banks being broken up is based on 1) the need to not lose the expertise, relationships and mechanisms such as would occur in large scale failures 2) TBTF being a drag on business, not an assist, as it was a century ago. 3)their lack of profitability in the sense of distributed profits. They teach the world how to operate on the edge of insolvency (from which side of the line is up for debate). I sense we are at one of those rare turning points in history. A decade from now we’ll be worrying about losing the baby with the bathwater. I enjoyed the exchange, AJ. This, of course, is a reference to the idea that banks such as Goldman Sachs Group Inc. were betting against the market at the same time as they were selling clients investments backed by mortgages. It’s something Goldman Sachs took pains to deny in a letter to shareholders this week. “If you believe that, you believe in the tooth fairy,” Mr. Greenberg said. Of course, he said, there will be those who say: Why should we listen to you? You’re the guy who ran AIG. “Michael Lewis, the celebrated author of “The Big Short,” claims that about 40 or 50 House Republicans skipped a hearing by Federal Reserve chairman Ben Bernanke last fall to spend three hours with him talking about the financial crisis. What would really end TBTF? Make sure the offices of the regulators employs three times as many accountants as lawyers. Thanks! I knew other readers would help me out! How about requiring the banks above $100bn in assets to provide their own “suicide” plan. It would have to show how all of their assets would be liquidated and their liabilities resolved as of current market conditions today. Then they would have to create scenario’s showing the same assuming the value of their assets declined to various levels. Once reviewed and approved by regulators, the plans become contracts that have to be executed if the value of the assets decline past the benchmarks. Put the onus on those very imaginative financiers to figure this out and then enforce it as part of the regulartory process. I thought the other idea was to impose a surtax on big banks to make up for the TBTF credit subsidy. Good spirited discussion.The TBTFs do not arise naturally from a “free market”. The systemic risk they pose is what economists refer to as an externality. The solution is not an ATT style break-up (which actually did not solve the problem of communication monopolies). The way to counteract the public subsidy which creates TBTFs is to tax them at a level which intenalizes the external social cost of the systemic risk they create. I agree that this may not be easy to calculate, but it is the right direction to go. The other approach that will work is to make minimum capital standars progressive based on size. Once a bank reaches a size threshold of systemic relevance (maybe $50B), capital ratios should be ratcheted up to discourage the public subsidy. Historically capital standards have been higher in practise for small banks than for big banks (they still are). Remove the capital subsidy for TBTFs through taxation or capital standards and small banks will win in the trenches. Agree, but instead of going the route of increasing the capital requirements for the TBTF it is much more important to eliminate the discrimination in capital requirements based on risk and that favored especially the operations of the already big… even to such an extent as to allow the big using their own internal risk management models to set their own capital requirement. This crisis resulted directly from the Potemkin ratings the market produced to satisfy the demand created by the regulators. The assumption is that there IS a marketplace – meaning that transactions are conducted (a) in public and (b) with sufficient information required to be disclosed that the parties to the transaction can perform sufficient due diligence and (c) regulations are vigorously enforced with penalties sufficiently painful so as to deter fraud. Without these three interlocking structural components, there is no marketplace, just financial anarchy. In the case of both derivatives and default credit swaps, (a) and (b) were absent and (c) was asleep or neutered. 1 – Systematic bailout of depositor and creditor who have limited stake in ensuring health of the financial institution. Even the FDIC limits on maximum deposit are ineffectual because banks effectively merge separate accounts. 2 – Limited ownership, while stock holders are wiped out, modern portfolio theory and regulation mute that. What percentage of assets does a mutual fund have in a bank, 1 to 2 percent. And they are prohibited from buying say 50%. Compare the failures of the big banks to that of smaller bank and financial institutions where the ownership is concentrated. We have to give other financial actors beyond stockholders a stake in the health of the banks to make any lasting difference to this problem. While I am sympathetic to the goal or small financial institutions to lesson the bailout pain, I fear that is closer to treating the fever and not the underlying disease. But if Bernanke hadn’t bailed out Bear in March 2008, the markets would not have “learned” that Too Big To Fail wasn’t the policy for all time. The “policy mistake” was saving Bear’s corporate bondholders, NOT letting Lehman fail. Alexander, it’s a myth that Canada’s banks were oh-so-healthy and needed no bailouts. There were major bailouts totaling more than twice the entire tangible common equity of the whole Canuck banking system!